J Clin Invest, 2015, 125(5): 1886-900. Cilengitide trifluoroacetate purchased from Selleck. BrdU incorporation was quantified in freshly isolated primary cholangiocytes treated with BSA (4 μg/ml), CCN1 (4 μg/ml), soluble JAG1 (2 μg/ml), DAPT (10 μM), cilengitide (1 μM), NBD (25 μM), or control peptide (25 μM). Where indicated, CCN1 (4 μg/ml) was added with other inhibitors. *P < 0.04, **P < 0.01, Student’s t test. (A) Comparison of blood vessel count of the linear and grafted peptides. Error bars indicate ± SD (n ≥ 6). The dotted line indicates ~50% inhibition of blood vessels. A one-way ANOVA with Dunnett's post-test using a multiple comparison test was used for statistical analysis. In addition, unpaired t-test was used to test the significance of MCoAA-02 against MCo-SST-01 and MCo-PEDF. ****p ≤ 0.0001 and ***p ≤ 0.05. All peptides were compared to 0.3 nM VEGF (highlighted in grey), which is represented as 100% blood vessel growth. Sci Rep, 2016, 6:35347.. Cilengitide trifluoroacetate purchased from Selleck. (D) The treatment more significantly inhibited cell invasion and proliferation in EGFRvIII-expressing GBM than vector cells in the environment of hypoxia and vitronectin-enrichment in vitro. All experiments were performed independently at least three times. *p < 0.05; **p < 0.01. Oncotarget, 2016, 7(4):4680-94.. Cilengitide trifluoroacetate purchased from Selleck. Elevated β-catenin expression was observed in OPNa-, OPNb- and OPNc-expressing cells. Addition of cilengitide did not alter β-catenin expression in any of the OPN isoform-expressing cells but induced E-cadherin expression in OPNc-expressing cells. GAPDH or β-actin was included as a loading control. Oncotarget, 2015, 6(26):22239-57.. Cilengitide trifluoroacetate purchased from Selleck. 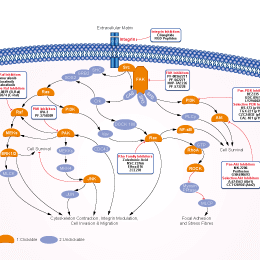 Cell growth inhibition of non-small cell lung carcinoma (NSCLC) by Cilengitide. Cilengitide is based on the cyclic peptide cyclo(-RGDfV-), which is selective for αv integrins. Interestingly, it acts differently on HTB183 and A549 cell lines. Cilengitide was more efficient on A549, lung adenocarcinoma, while in HTB183 it showed moderate inhibitory activity. This may be due to the mestastatic nature of HTB183 cells which have already lost the cell adhesion properties. Dr.Milica Pesic from Institute for Biological Research . Cilengitide trifluoroacetate purchased from Selleck. Recombinant soluble integrins are immobilized, and peptides, which are serially diluted in Tris-buffered saline (TBS++) (0.1% (w/v) BSA, 150 mM NaCl, 1 mM CaCl2, 1 mM MgCl2 10 μM MnCl2, 20 mM Tris-HCl; pH 7.4), are added in parallel with biotinylated vitronectin (to 1μg/mL). After a 3-h incubation at 37℃ and washing with Tris–buffered saline, bound ligand is detected by incubation with an antibiotin alkaline phosphatase-conjugated antibody (BioRad) followed by development with p-nitrophenyl phosphatase substrate. The reaction is stopped by the addition of NaOH and the color intensity read at 405 nm. Method: HMEC-1 (1×104 per well) are seeded on uncoated 48 well plates and incubated in medium containing 4% FCS with Cilengitide. After incubation for 72 hours at 37℃, cells are trypsinized and counted. Reardon DA, et al. Genes Cancer, 2011, 2(12):1159-1165. Nisato RE, et al. Angiogenesis, 2003, 6(2), 105-119. Oliveira-Ferrer L, et al. J Exp Clin Cancer Res, 2008, 27:86. Taga T, et al. Int J Cancer, 2002, 98(5):690-697. Burke PA, et al. Cancer Res, 2002, 62(15), 4263-4272. The recommend vehicle is 30% propylene glycol, 5% Tween 80, 65% D5W at 30mg/ml, can you let me know if this is a suspension or clear solution? S7077 Cilengitide can be dissolved in 30% propylene glycol/5% Tween 80/65% D5W at 10 mg/ml as a clear solution. Is Cilengitide a TFA salt? S7077 Cilengitide is actually a TFA salt, and the ratio between Cilengitide and TFA is 1:1.